With more than 85,000 employees, TD Bank Group is the sixth largest bank in North America by branches and serves more than 25 million customers in three key businesses operating in a number of locations in financial centers around the globe: Canadian Retail, U.S. Retail and Wholesale Banking. 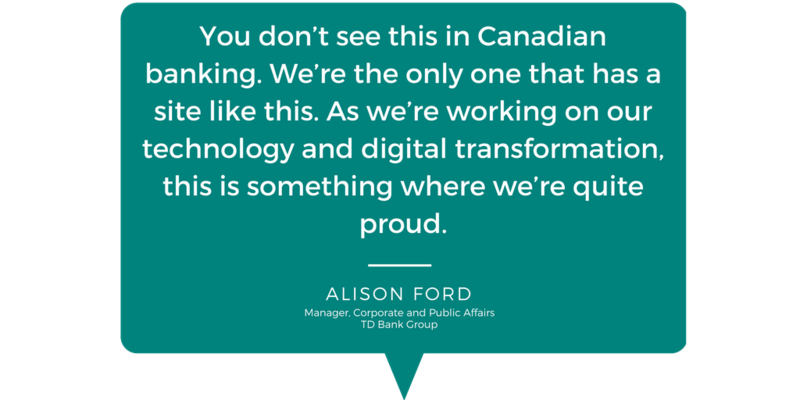 TD is a leading digital bank in North America with approximately 11.5 million active online and mobile customers. We have a responsibility to evolve our relationship with our customers, to make it easier and more seamless for them to achieve their financial and life goals. 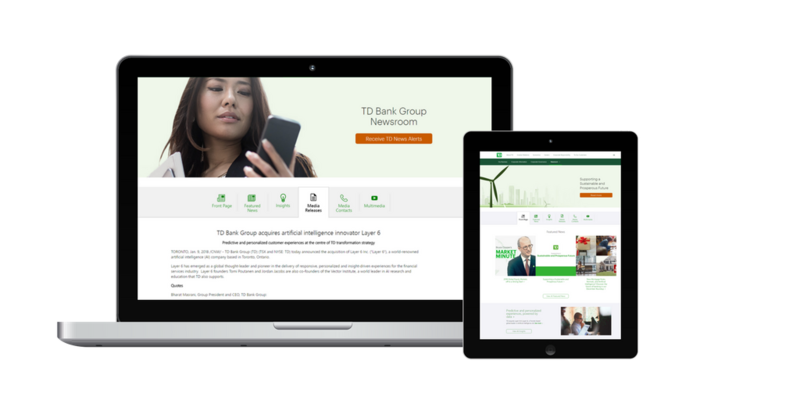 Anyone who visits the “TD Newsroom,” TD Bank Group's new dynamic news outlet site, will immediately recognize a brand that’s thinking differently about the information needs of its audience. The front page of the site includes feature stories on subjects such as financial literacy for consumers, events and announcements making the news, insights from its leaders and much more. Of course, a launch like this involves a lot of moving parts -- and for one of the key parts, TD's Canadian team relies on Cision. Though it was launched in February 2017, the TD Newsroom took several years of planning and thinking deeply about the volume and variety of stories it would include, in the format its audience wants them. According to Alison Ford, Manager, Corporate and Public Affairs, TD the end result weaves together news, announcements and compelling digital content that tell stories from a brand journalism standpoint about every aspect of TD and events and issues impacting its customers, shareholders and stakeholders, in a way that’s consistent with a more traditional news outlet publisher. That kind of rich portal takes a lot more work, however. Ford says the TD Newsroom might publish four or five times, sometimes seven times a week. And the TD Newsroom is only growing, with the goal to increase the cadence of stories and further enhance the human and storytelling aspect of the content. Beyond the newer forms of storytelling, meanwhile, more traditional ways of informing media about its various activities needed to be maintained and mesh with the new design. TD uses Cision MediaRoom, a service that helps organizations automate and control the display of news releases and other media and investor content on secure webpages that are designed, developed and managed by Cision. Using Cision MediaRoom saves organizations time and reduces the complexity involved in setting up an online communications hub while providing the best platform to bring visibility to their most important announcements. Design that meets brand and audience needs: TD wanted to ensure that everything about the media releases section matched the look and feel of the rest of the site. Ford says the Cision team was a valuable partner in this process, and also made sure the final version was responsive and renders well on mobile devices such as smartphones and tablets. “Working with Cision, it was seamless,” she says. Integrated campaign capabilities: There was a time when all companies would send is a media release about a particular announcement. Now, however, Ford says the TD Newsroom develops a content strategy where a media release contains important research statistics, with the lead being a featured news story or an “Insights” piece from one of its thought leaders. Cision’s management of the media releases area makes linking across different pieces of content quick and easy. Owned audience development: TD also takes advantage of MediaRooms’s email alert management features. On the media releases section, for example, visitors can click a button to receive more information from the bank. “So when people sign up, they can choose which categories of information they most want to hear from us about,” Ford says. This means TD is creating a direct channel for the rich content the team continues to develop that drives traffic back to the site. It’s not always easy pioneering into new areas, but Ford says working with Cision has helped take TD further than most organizations of its kind with the TD Newsroom.